By now you may have realized that my cohorts (my mental health support group…my partners in crime) and I are on a roll! We had so much fun with our December group post featuring cakes that we decided to create a new series of recipes each month. We brought you dips in January. February was “Love and Food”. 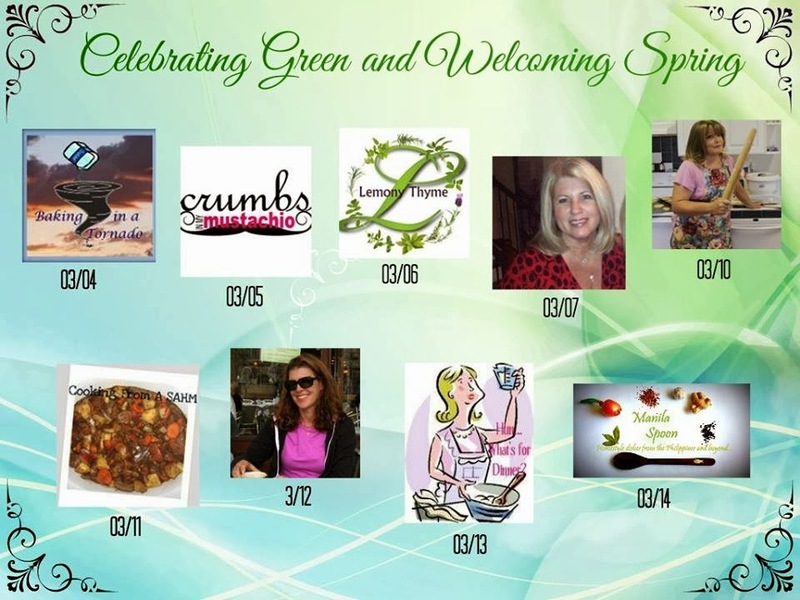 Now we are “Celebrating Green and Welcoming Spring” with recipes that include a naturally green ingredient. 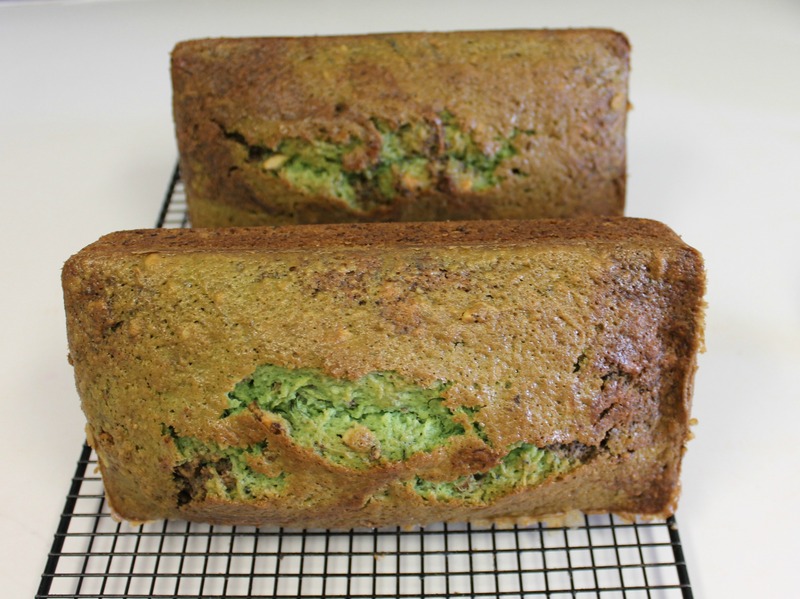 This was a little challenging for me since I love to make EVERYTHING green on St. Patrick’s Day, using copious quantities of green food coloring…which was not an option. 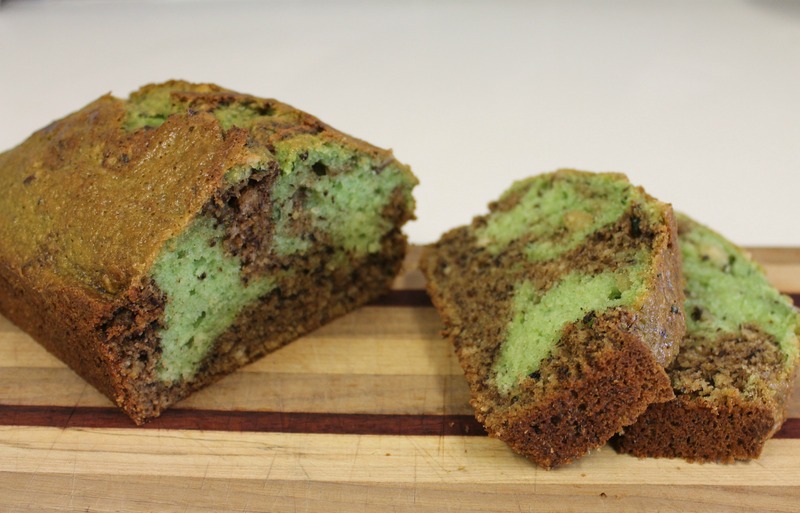 Zucchini was my “green” of choice, and I added a little spirulina (you can buy a small amount of it in bulk at most natural food stores) to deepen the color of a chocolate swirl zucchini bread. I originally used Irish Cream in the recipe, but even with the spirulina it just wasn’t green enough, and though it was tasty, I really wanted a little more flavor. Chocolate mint is a combination I love, so I swapped out Creme de Menthe for the Irish Cream and was very, very satisfied. Not a natural green source, of course, but I figure the zucchini and spirulina bought me a little leeway. Either way is good, so I’m leaving the choice up to you. Or, if you really don’t want to use booze, you can always substitute milk and add teaspoon of peppermint extract for flavor. In a large bowl, combine the flour, sugar, baking powder, baking soda, salt, and walnuts. 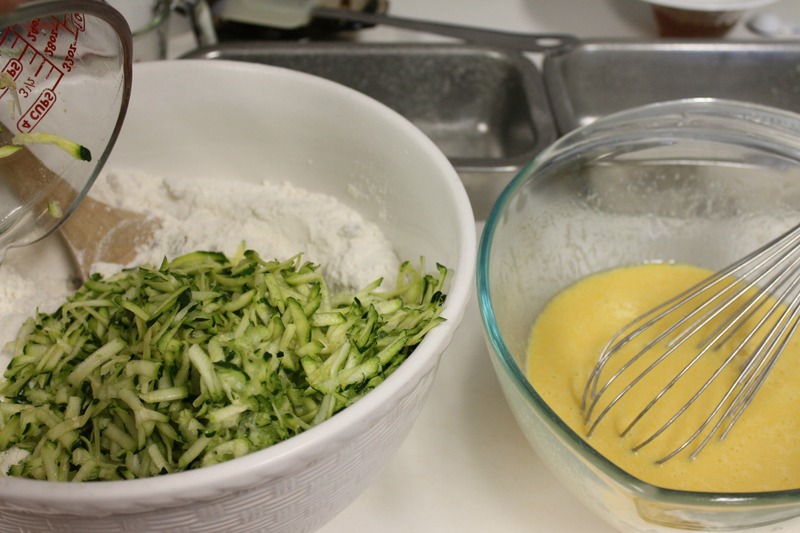 Add the grated zucchini and toss to coat. In medium bowl, whisk the eggs well. 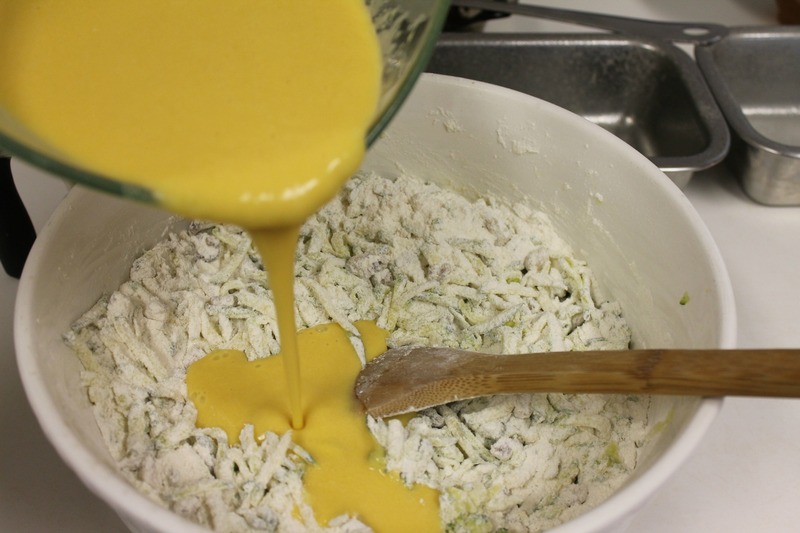 Add the oil and buttermilk and whisk until combined. Add the liquid ingredients to the dry ingredients (don't put the medium bowl in the sink - you'll use it in a minute) and stir just until most of the flour is incorporated. Put half of the mixture back in the medium bowl. To one bowl add the coffee and melted chocolate, and stir until it is combined. Don't overstir! 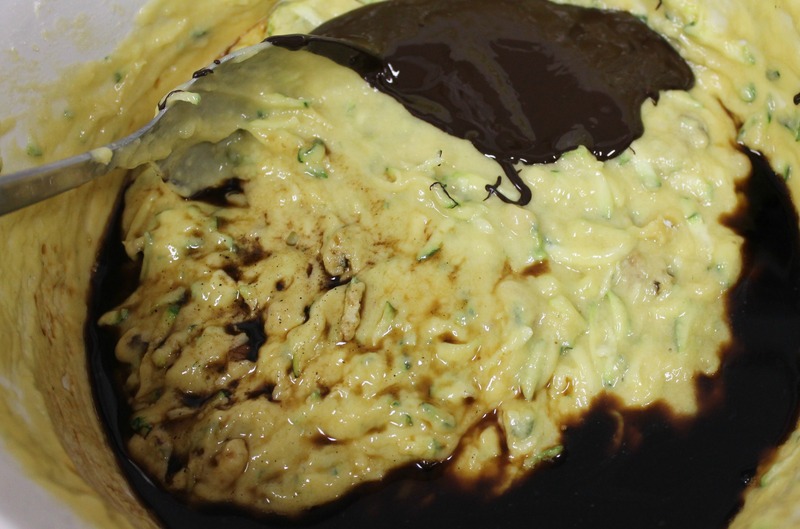 To the other bowl add the creme de menthe and spirulina. Stir until just combined. Divide the chocolate mixture evenly between the two loaf pans. 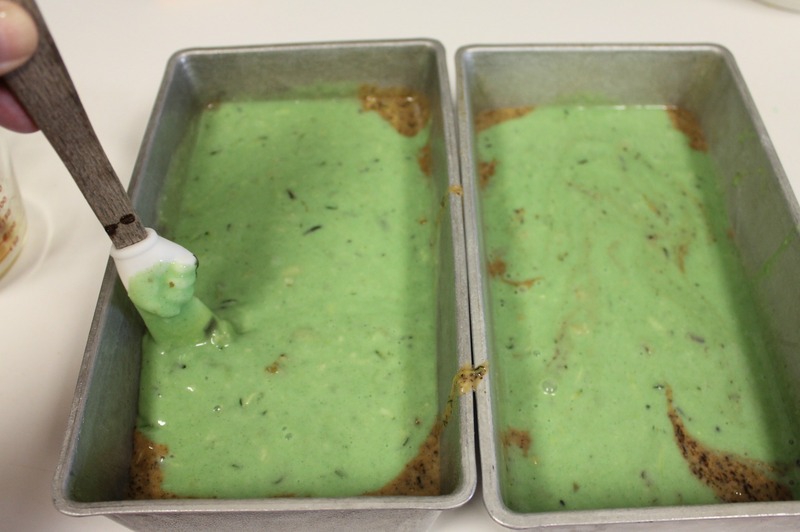 Pour the green mixture over the chocolate mixture and swirl a little with a rubber spatula or table knife. Bake for approximately 1 hour and 10 minutes, or until a toothpick comes out clean when inserted in the middle. Cooking time will depend on the size of your loaf pans. When I used slightly smaller pans the bread took a few more minutes to bake. Remove pans to a rack and allow them to cool for 10 minutes before turning the bread out. Allow bread to cool completely before cutting. Dry ingredients in one, liquids in the other. Add liquids to dry ingredients. Here are links to the other recipes this month. Please visit the ones that have already been posted – there are some impressive ideas from some very talented gals – and then check back because I’ll add the new recipe links as they’re presented. 3/13/14 Maple Poached Pear Salad with Walnut Crusted Goat Cheese from Hun…What’s for Dinner? 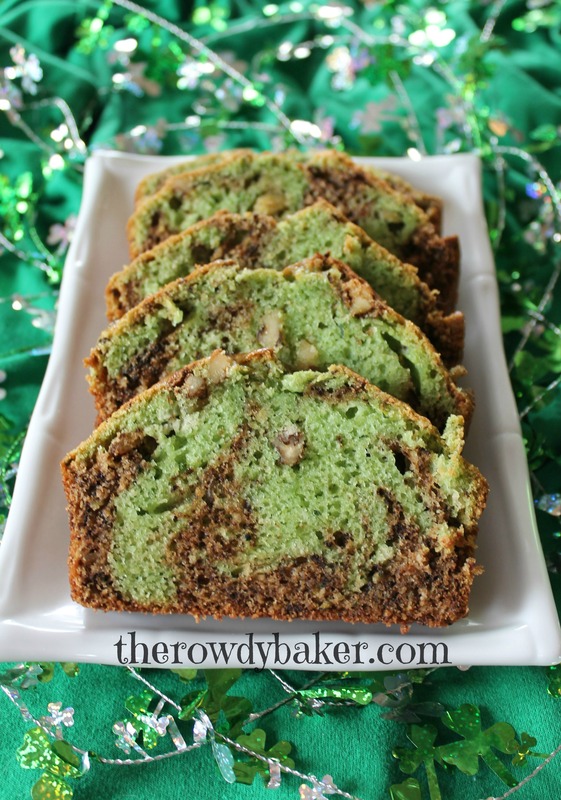 This entry was posted in Breads, Holidays and tagged Chocolate mint zucchini bread, chocolate zucchini bread, creme de menth bread, creme de menthe, marbled zucchini bread, St. Patrick's Day dessert, zucchini bread by Lorinda. Bookmark the permalink. I’ve never used spirulina before but I’m trying this bread (yay, no yeast) for sure. 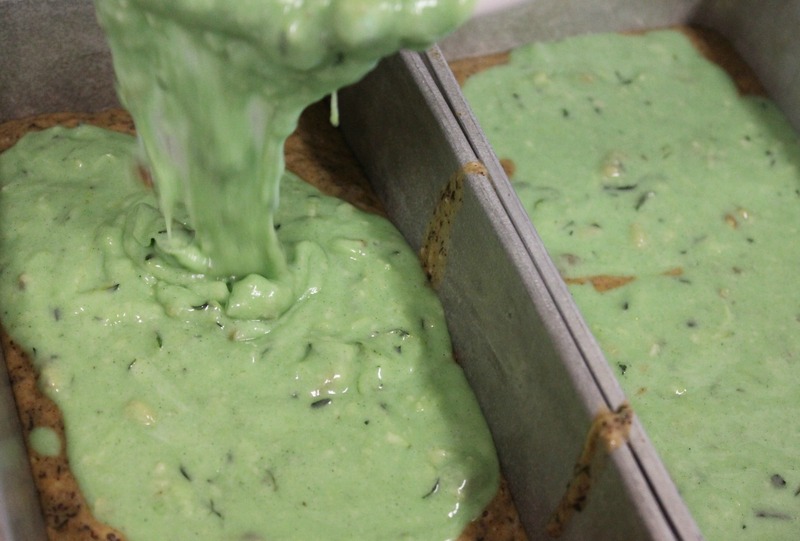 It doesn’t take much to add some deep green color…you won’t even know it’s in there. Good for you, too! Great recipe Lorinda. It looks so moist and yummy. Thanks, Libby! Very moist, and it’s perfect for St. Patrick’s Day, too! OOOHHHHH!! Mint chocolate??! And it’s a health food with all that zucchini, right??! I just might need to try this one! (That means I’m definitely trying this one!! I’ll give it a whirl with GF flour because the Girl loves mint and chocolate combos!) I’ll let you know how it turns out!